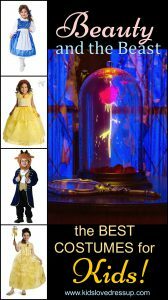 Beauty And The Beast Costumes For Kids: The Best And Most Beautiful! 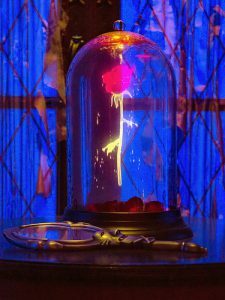 Beauty And The Beast Costumes For Kids: Helping You Find The Best Ones! Beauty and the Beast. It’s a “tale as old as time, song as old as rhyme…” If you’re on the hunt for some fabulous Beauty and the Beast Costumes for Kids, I’m sure we can help you find some of the best ones here today at Kids Love Dress Up! I love hunting down the best dress up clothes for kids – ones that they can wear over and over again – and that will inspire them to hours of imaginative play. And these kids Beauty and the Beast costumes will definitely do just that. Most of us parents and grandparents can likely sing the songs and quote many of the lines from the Disney classic (1991 animated version). And now with the latest Hollywood release, the love for this story is beginning all over again, and pulling in a new generation! So many of our kids are loving Belle, the Beast, Lumiere, Cogsworth, Mrs. Potts, Chip, even Gaston, and the other characters all over again. And wanting to dress up in costumes as these beloved characters! 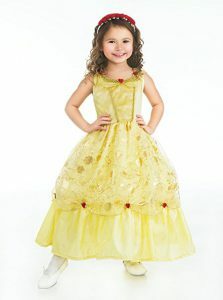 The iconic yellow ballroom gown is “The Gown” that little girls everywhere will recognize as belonging to Princess Belle. (All of the Disney Princesses have their own uniquely colored gown to help little girls identify them – Belle is the only one with a fully yellow gown.) 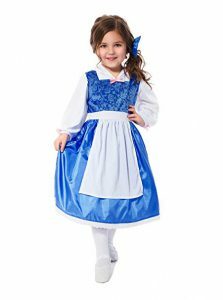 There are lots of different versions of her gown available on costume websites and of course, Amazon – seriously the cheapest and best place to get kids dress up clothing. But I’ve dug through the options of you and have for you here 5 of the best rated and highest reviewed gowns, so that you can be sure you’ll be (I mean, your girl will be 😉 ) happy with your purchase! 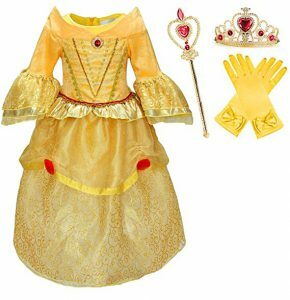 If you’re looking for a classic, authentic looking Belle costume for your little girl, this is possibly the best option for you! INCREDIBLE price, reviewers note that it’s fantastic quality, and you should SEE how cute the submitted pics are of kids in this gown (see link below)! It’s shiny (no glitter everywhere), soft, flowy, comfortable, and that lovely bright sunny yellow that Belle is so famous for. Love it! CLICK HERE to see price and details at Amazon! Your little girl will look like a true Beauty in this detailed and elaborate costume set! The gown is full of fine, glittery details that will make her feel so royally pretty! And the accessories are all included! Reviewers say that the quality of the dress and gloves are exceptional – making it totally worth the (very decent) price – but the scepter and tiara are your standard costume jewelry quality, meaning the jewels may need to be glued back on. This satin-looking creation by ReliBeauty is a lovely choice for a Princess Belle dress up gown! It’s a lower-priced but beautiful option for Halloween, a princess party, or for everyday dress up! The layered hem, the drop sleeves and spaghetti straps, and the rosette details are very “Belle-like” – your little girl will love them! This is an officially licenced Disney product – the stunning gown will be easily recognised as “Princess Belle” and easily LOVED by your little girl! The gown has glittery and shimmery Princess designs on it, golden trim, rosette details, and so much more! Reviewers say that it’s very good quality, and sizes run fairly true. Accessories are not included – just the dress with the Belle cameo. Sizes available are XS (3T-4T), Small (4-6x), and Medium (7-8). 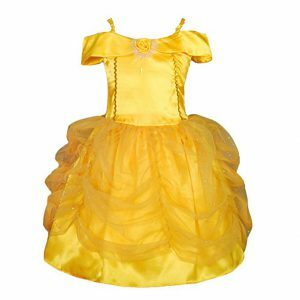 This pretty yellow Princess Belle is probably my personal top choice of Belle gowns. It’s soft, not itchy at all, has lovely sparkly details and trim, is easy for kids to get off and on. 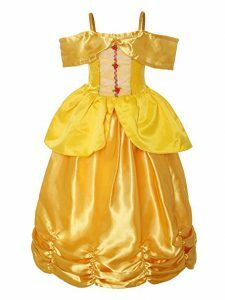 It does NOT have a character camo on it, which is actually a plus for me (and many of you too, I’m sure) – I love it that my daughter could play dress up “as Belle” in it, but also as any other Princess she imagines that day, such as “the Sunshine Princess”, or “Princess Buttercup”. Oh, and I love Little Adventures costume quality! And the fact that they make their costumes machine washable is AMAZING, right, Moms? Isn’t this dress ADORABLE? I love the fancy details on the chest that make this “simple day dress” something special yet. Little Adventures is a company (started by Moms who didn’t like the quality of other costume dresses they found) that makes fantastic quality gowns, so anything from them is great stuff: soft, comfortable, stretchy, and easy to get off and on by little fingers! Hair bow is included! Currently rated 4.7 of 5 stars by customers on Amazon! CLICK HERE to see current prices and sizes available! 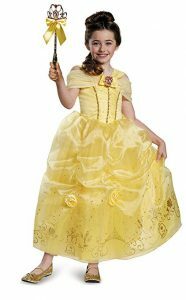 This dress doesn’t come in very small sizes, unfortunately (girls size 7 is the smallest), but it’s so sweet and authentic looking and would be just perfect for your tween or young lady if she wants to be Belle – the “pre-Princess” version! The dress, apron, and bow are included with this Belle gown. The apron is detachable, but the rest is one piece. It is shiny, but soft, smooth, and the color is “right on” according to the reviewers! Currently rated 4.6 of 5 stars by customers on Amazon! I hope you’ve found some solid ideas here for fabulous Beauty and the Beast costumes for kids! It’s such a fun dress up theme – may you and your kids have a wonderful imaginative time together with them decked out in these costumes! As always, let me know what you think in the comments below! I love hearing from you! Dress Up Clothes For Little Girls: What Are The Most Popular Disney Princess Gowns? Princess Dress Up Shoes: There Are More Styles and Options Than You’d Think! Guidecraft Castle Dramatic Play Storage Unit: Love It? Or Leave It? What Are The Best Toys for 2 Year Old Boys? Here Are Our 12 Favorite Choices! Those dresses are adorable. In some ways I am glad they were not around when my granddaughter was into Belle… but they are beautiful and the prices aren’t too hard on the pocketbook. I think the Beauty dress up gowns are beautiful too! I think there will be many Belle gowns added to dress up boxes in the near future! Beauty and the Beast is definitely a classic story, and I think kids (and us adults) just love the characters! Who is your own favorite? Did you have a favorite costume from these here?